In today’s information-driven society, it’s much too easy to feel over informed, overwhelmed and totally confused. With the discovery and access to new information daily, the game is constantly changing, often completely altering everything we thought we knew to be true. Whether it’s the latest diet and health trends, a new industry opening up, or a political crisis sparking a new social movement–it’s hard to feel grounded when everything is constantly shifting. I’ve been feeling this shift pretty drastically lately. On a personal note, I recently quit my full-time job to redirect my career path. A series of side projects and hobbies ignited new interests and led me to discover I wasn’t passionate about the path I was on. This is important information to know, that I didn’t leave knowing exactly what I wanted to do. I’ve never been the kind of person who can stay in a situation I knew wasn’t right. I like to have a plan but I also make instinctive, gut-based decisions because I know I feel the way I do for a reason, even if I haven’t quite figured out the reason yet. This process has left me living in the in-between, which feels a lot more like The Upside Down in Stranger Things these days. It’s scary, confusing, intriguing, and seems to have the answers I’m looking for, but I need to crawl through all the mess before I can come out safe on the other side. Every time I get an answer to a question I feel like 10 more questions arise. Every moment of relief is followed by another moment of confusion. Am I on the right track? What’s my next step? Can I trust myself? Is there a right or wrong? What will happen if I try this? What will happen if I try that? How am I going to pay my bills this month? Does any of this even matter? The great thing about each of our journeys is that they’re 100 percent our own. There’s no right and there’s no wrong, there’s only what we choose. But lately I’ve found the key to making my journey successful, no matter what stage I’m in, is leaning into what I know and ignoring the things I don’t. And keep in mind, there will always be much more that you don’t know, but don’t underestimate the power of what you do. Many of us first learned this lesson from the legendary (and my all-time favorite) Bob Marley telling us, “every little thing is gonna be alright.” But do we really always believe that? How to deal: Next time you find yourself with your stomach twisted in knots, your palms gripped tightly around your steering wheel, your throat tight and your heart racing, put on “Three Little Birds” on repeat until you start to feel a release. Remember that everything that has you feeling like the world is coming to an end will soon pass; the birds will chirp, the sun will still rise and everything is going to be alright. Every moment of your life is leading you to the next. There is nothing that has or will happen to you that is not helping you learn the lessons you need to learn, meet the people you need to meet, and uncover the feelings you need to feel. Your saving grace when you feel unsure, is knowing that you are exactly where you need to be. Nothing ever happens by accident and even though you can’t see the full picture now, doesn’t mean it won’t all make sense soon. How to deal: Next time you feel lost or off track, write a list of all the steps you’ve taken on your journey that have led you to this place, whether it’s in the area of love, career, or health. Take a look at how each moment before it helped you get here. Don’t leave anything out, especially the hard, “it’s never going to get better, why me” moments. And then realize that it did get better. You were never off your path and the next step is just a few deep breaths away. It’s unrealistic for us to expect things to stay calm and peaceful all the time. The events that unfold and the emotions we feel day-to-day often come in unexpected waves. We can be riding on a total high and then a wave comes crashing down and it’s hard to breathe or call for help. But it’s not the events that dictate your experience. It’s how you decide to handle them. Are you going to sink to the bottom or learn to surf? Are you going to wallow in self-pity and feel sorry for yourself? Or are you going to use each moment as a learning lesson and decide to find joy even in the hardest times? We all have this choice and no one can or will make it for you. How to deal: This one is a bit trickier because it’s an internal decision that must be made. The decision is this: Are you going to swim, not sink, when times get tough? If you are having trouble learning how to surf on your own, call on someone who’s been there and who inspires you. It’s not your job to know how to do everything alone. Ask for help! If it’s not someone you know, look to your resources. There are millions of others out there who have been and will be in similar situations with similar emotional battles and are willing to share their experiences with you. Maybe they sank at first and then learned how to surf the next time the wave came around. Reach out, ask for guidance, and the universe will always provide you with the answers you need. And if you don’t know where to turn, I’m here for you! Whether it’s reading a blog post or reaching out directly, you are never alone, there is always help and you can always surf through the wave. So many of us wait to become our “future selves.” We dream about what it will be like when we get there and how we’ll look, act, and feel. But why are we waiting? Do you realize that you are the future self you were dreaming about a year ago? Five years ago? When you get to the “future you” you are dreaming about today, will you still be thinking about what you’ll look, feel and act like in the future? You’ll never get there if you continue to think of the “future you” as anything else than the person you are right now. How to deal: Close your eyes and imagine yourself in a year from today. How will you look? How will you act when stressful situations arise? What will you feel when you look in the mirror? How will you dress and take care of yourself? Will you practice self-care and self-love? Are there habits or routines you’ll have instilled? Write it all down. Now, start acting those ways! You are the same person who will do, feel, think and say all of the things you just envisioned. There is no need to wait. You will not wake up one day as a different person. It’s a day-to-day, step-by-step, moment-by-moment process and it starts right now. Start embodying the person you’ve always dreamed of becoming, even if it feels weird at first. You’ve heard the saying, “Fake it til you make it.” Step inside that girl who’s been trapped in your mind. Take her out of the shadows and let her shine brightly. So once again, I don’t have all the answers, but I do have some. When you aren’t sure what to do next, stick to what you know and lean into what brings you joy. There is enough information out there to turn your head into the next Hiroshima. So in your biggest moments of fear and doubt, turn off the news, get off Facebook and do something you know puts a smile on your face. I guarantee you’ll begin to remember that no matter how dark it is, every little thing is going to be alright. Previous ArticleWhat Does A Day In The Life Of A Dating Coach Look Like? Angela Ribbler, Chief Unicorn, founded It’s A Onesieful Life™ with the mission of making the world smile onesie at a time. Residing in the magical city of Denver, Colorado, Angela has always felt a pull to create positive change through her powerful writing and uplifting energy. 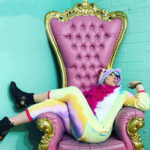 Through her custom onesies and inspiring vlogs, blog posts and social media content, Angela intends to create a community of Unicorns (known as a Blessing) to infuse more magic into the world.